You don't see a lot of RCs made with tank-like treads, so the New Bright Tread Zone RC really stands out with its use of treads up front, and regular wheels & tires at the rear. It's just a striking looking vehicle, and you don't quite know what to expect from it. The treads are made from a soft rubber for good traction, and they are what power the vehicle -- the wheels just roll along. There's spring suspension on the treads too, and they rotate up & down to presumably get over small obstacles. Best of all, the Tread Zone comes as a ready-to-run deal -- rechargable battery pack, charger, and controller batteries included! I had no idea how fast this bizarre creation would go, but I expected it to handle at least some basic off-road terrain, so I started my test in a dirt field. It has non-proportional controls, so as soon as I pushed the throttle stick forward, it took off at full speed! Its acceleration is phenomenal. Its top speed isn't tremendous, but then again, it's not a Formula 1 racecar. It actually feels faster than it is because it accelerates so quickly. It also turns very quickly, because it uses tank-like "skid" steering. It will even turn in place without moving forward at all. Just leave the throttle stick untouched and push the direction stick either way, and the treads will go in opposite directions, making the vehicle spin like a top. Dusty dirt and small rocks didn't challenge the Tread Zone one bit, so I moved to rougher & tougher terrain to see what this thing could do. The tank treads and pivoting suspension worked great! It was able to get over some stuff that I would normally consider "rock crawler" terrain. I could definitely get it stuck, as its ground clearance in the center is pretty low, but most of the time some careful maneuvering could get it out of its own predicament. 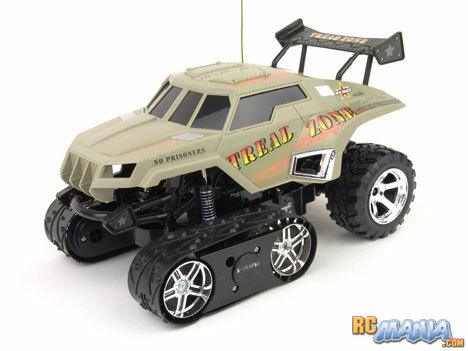 I think New Bright took a gamble with the odd design of the Tread Zone RC vehicle, but it paid off. The price is respectable for the size of vehicle it is, and it comes with all batteries included, including a reusable, rechargable pack for the vehicle itself. The vehicle has, if anything, an excess of power, and though it's not a speed demon, it's very agile and can blast over some really torn-up Earth. I don't think the Tread Zone is for every RC fan, as it is somewhat difficult to classify its form, but if you like the concept and how it looks, I think you'll like how it drives just as well.